Lul Mohamed, director of the paediatric ward at Banadir Hospital in the Somali capital, Mogadishu, treated five children after two bomb attacks killed 30 people on 14 April. "And they were shooting last night. One died, a bullet in his liver," she said of an eight-year-old boy. Mohamed hopes this year to immunize 1,000 children per month in the hospital's tiny but brightly painted vaccination room. Two volunteers sit at a desk, another monitors those coming in and out. They say they became volunteers when donors pulled out and staff were let go. By 1pm that day, they had vaccinated 28 children. "A huge improvement in a short time - if peace holds," Mohamed said. Coinciding with World Immunization Week, the Somali government announced on 24 April its intention to vaccinate all children under the age of one with a new five-in-one vaccine, known as a pentavalent vaccine, funded by the GAVI Alliance, with the UN Children's Fund (UNICEF) and the UN World Health Organization (WHO) as implementing partners. "Children in Somalia are dying of diseases that are prevented in the rest of the world," said Maryam Qasim, the Minister of Development and Social Affairs, speaking at the vaccine’s launch. "Introducing this vaccine is a milestone in history." Currently, fewer than half of children in Somalia have received the mandatory diphtheria, tetanus and pertussis (DTP) vaccine, a rate that Anne Zeindl-Cronin, senior programme manager at the GAVI Alliance, describes as "incredibly low". Only 7 percent of children in Puntland and 11 percent of children in Somaliland receive the required three doses by their first birthday, according to a joint UNICEF and government survey. "Coming from such a low base, if we have system strengthening, we should see a huge improvement in a short time - if peace holds," Zeindl-Cronin said. Eighteen months passed between country's decision to use the pentavalent and implementation of the programme, and Zeindl-Cronin recognizes that difficult tasks still lie ahead for GAVI's implementing partners. "It's easy to come here and put [the vaccines] in [a] fridge. It's getting them into the children that's the challenge." "Normally, there is one food and drug administration. But where? Is it in Mogadishu? Or in each of the zones [south-central Somalia, Somaliland and Puntland]?" said Marthe Everard, WHO's representative for Somalia. In his speech at the pentavalent launch, President Mohamud condemned Al-Shabab for blocking access: "In the certain areas they control, there have been no vaccinations at all in the past few years. Al-Shabab needs to understand that they are not only killing people through explosions, but every child that misses vaccinations they have practically killed." The pentavalent vaccine launch is being accompanied by an awareness-raising campaign. Sikander Khan, UNICEF Somalia Representative, hopes that, once demand is created, the vaccine will reach women even in areas that Al-Shabab controls. "There is no parent in the world who doesn't care about the well-being of their child," he said. 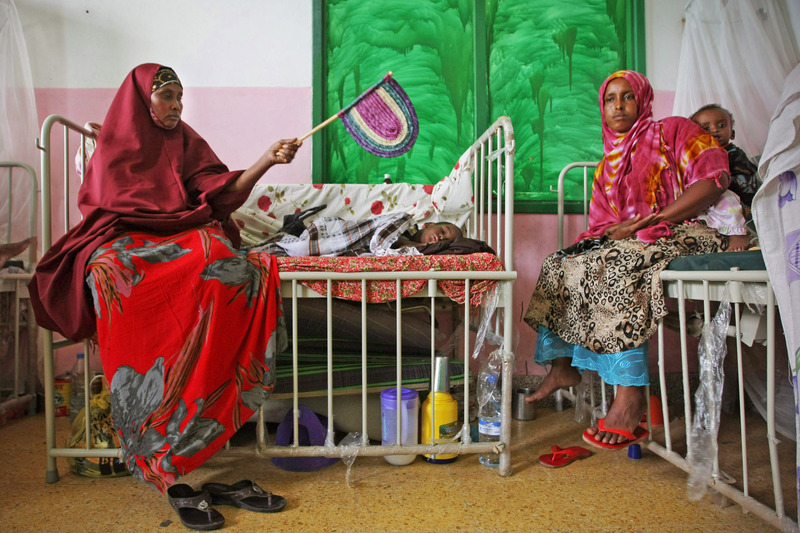 Farhiyo Mohamed, who has six children, brought her youngest to an outpatient clinic in Benadir, Mogadishu, to receive the pentavalent at no cost. The mother says she visited the clinic when Al-Shabab was still in the city, but that it was dangerous to do so. "Al-Shabab would question you when you came back. Today, we are happy," she said.